Following on from the previous blog post about an artist who lampooned Muybridge’s work, I was spurred by a posting on Coconino-World into investigating the artworks of Henry Stull (1851-1913). Cartoons by Stull appeared in the shortlived magazine Our Continent (1882-1884), and were unearthed by John Adcock of Yesterday’s Papers, from a microfilm edition. A keen sketch artist from Canada with no formal training, Stull wanted to be an actor but gradually settled into drawing and painting in the USA. Stull eventually became one of the foremost horse painters of his era. Henry Stull would quite likely have attended Muybridge’s lecture, as the photographer had given several presentations in New York in 1882 and early 1883, including a talk at the Turf Club in November ’82. These talks would have included silhouette and semi-silhouette images on the screen, both static (single images and multi-image sequence panels) and in motion. There are several points about Stull’s panels that are somewhat curious, and raise questions. First: the 1883 lampoon of Professor Abridge photographing a kicking mule precedes Muybridge’s photography of Ruth, the kicking mule! Second: what exactly is the reference to clocks in the sequence of a boy chopping wood? It’s evidently part of the joke that the clocks all show widely differing times, but Muybridge didn’t use clocks in his photo sequences. Marey, however, did so – but only after 1883. Is the artist somehow ‘in the know’ about an intention by Muybridge to use such clocks, given that Muybridge patented a device for keeping clocks in synchronization? Third: did Stull’s use of silhouette and semi-silhouette precede or follow publication of Muybridge’s silhouette sequences? (i.e. were there earlier published sequences by Stull that made use of a silhouette technique.) 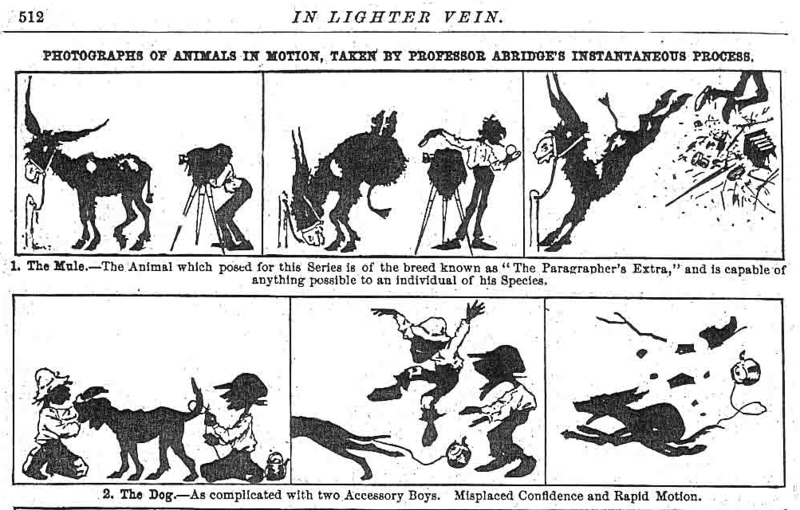 Certainly his use of the technique predates his direct lampooning of Muybridge in April 1883, as this example from January shows – but Muybridge’s New York lectures had been late the previous year, so perhaps there was an influence. The following year, Henry Stull disappeared for a while…. “After receiving a great deal of harsh criticism he vanished from the equine world in 1884. Six months later he reappeared, having acquired markedly better skills at depicting the horse; it is believed that he spent at least part of his absence studying equine anatomy at a veterinary school. ‘The Great $10,000 Match Race At Sheepshead Bay, June 25, 1890 Salvator & Tenny’. 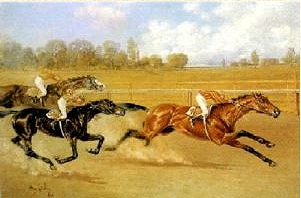 Even in 1890, he was happy to continue with the old-fashioned style of depicting a gallop. Perhaps hoping to be able to have his cake and eat it, in this 1910 painting Stull includes both the traditional ‘rocking horse’ gallop gait, and the more accurate ‘legs tucked under’ gait that was rarely seen before Muybridge’s photography. Henry Stull continued painting horses, for important clients, until 1911; he died in 1913. Henry Stull cartoon, ‘Our Continent’ 21 March 1883. This entry was posted in 19th-century photography, painting and drawing and tagged cartoon strips, Henry Stull, Muybridge, silhouette. Thank you, an excellent post. I first saw Stull’s cartoon images when researching pre-cinema for my PhD (when they were also generously supplied by John Adcock, the hardest-working researcher in Canadian comics!). 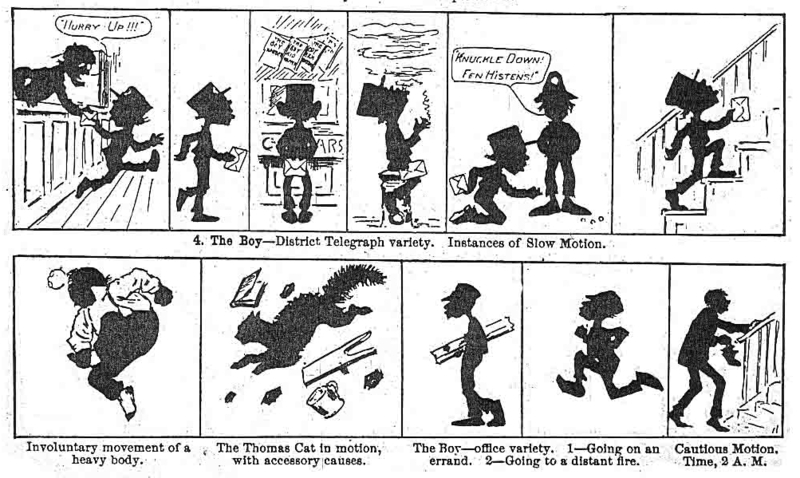 The silhouette style of illustration in comics was actually quite popular just prior to the date of these strips (especially in continental material, where it had been quite a vogue), so I don’t think Stull’s use of it (pre-Muybridge or not) is too surprising, although he may have continued to evoke the style in knowing reference to Muybridge’s projections and other images. As to the clock motif, I would suggest that the clock itself may not be that important, except as a way of drawing attention to, and poking irreverent fun at, Muybridge’s occasional habit of “doctoring” his sequences, re-ordering them or using clearer or more representative shots, rather than adhering strictly to the exact sequence as photographed. You refer in passing to Frost’s Stuff and Nonsense cartoon, and this contains a similar wry comment on this point – the artist holds one of Muybridge’s chronophotographic grids of a galloping horse, but one of the images is actually running in the wrong direction! I’m always fascinated to see rare Muybridge material, and so am delighted to have discovered your blog and associated website – I’ll be visiting regularly. Thanks for your comments and observations Lance – and I hope you enjoy future posts.